Our neighbors over in Little Italy have a packed schedule of events for everyone to enjoy over the next few months! Little Italy is charming and historic and right down the street from the 1840s Carrollton Inn! This is a highly recommended place for our guests to try. They have some of the best Italian food I’ve ever tasted and have awesome festivals to encourage making their Baltimore home a tight-knit community. So what’s going on over the next few months? 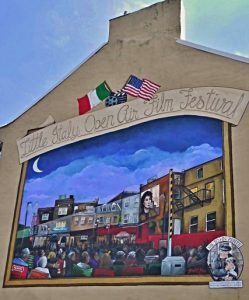 One of Little Italy’s most popular events, sponsored by the Original Little Italy Restaurant Association, the Open Air Film Fest has thrived since 1999. Movies are projected onto the outside wall of Ciao Bella Restaurant in the Da Mimmo Ristorante parking lot from a row home across the street. 7PM: Folks arrive early to set up lawn chairs, listen to live entertainment, stroll the neighborhood, enjoy FREE popcorn, and/or eat at one of Little Italy’s many restaurants. There will be a feast in August you won’t want to miss out on! The Feast of Saint Gabriele will be going on August 20-21. For more information about the festival, visit the Little Italy website. Vendors and volunteers are welcome to inquire about participating in the festival.